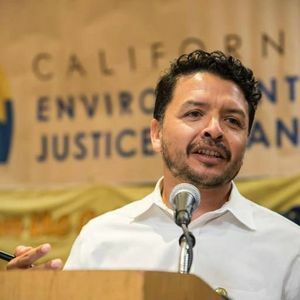 Byron Ramos-Gudiel leads Communities for a Better Environment, Los Angeles. He took over the job in 20014 from Bill Gallegos. Gudiel is a member of Freedom Road Socialist Organization. While serving as Director of The Coalition for Educational Justice (CEJ), Byron worked with staff, members and allies to improve the educational experience and environment of young people of color in Los Angeles and throughout California. Later, as the Director of Organizing at the Sierra Club, Byron led organizing efforts throughout the country to challenge the extraction, export and burning of fossil fuels, protect and create access to public lands, protect endangered species, and promote clean and renewable energy development. During his time at Sierra Club, he worked with members, staff, and allies to demand that people in low-income communities and communities of color have access to clean and renewable energy industry jobs and careers. Freedom Road Socialist Organization (National) - Byron Gudiel, Jamala Rogers . California Environmental Justice Alliance and Communities For A Better Environment in Sacramento demanding that the health of EJ communities be prioritized over the interests of the oil industry. Joined by Sebastian Ridley-Thomas, Senator Fran Pavley and Cristina Garcia. California Democratic Party do the right thing! Vote YES! #SB350 and #SB32. Those invited, on Facebook included Byron Gudiel. My good friend Arturo Carmona is running for California's 34th where I live! Happy to support progressive leadership. This page was last modified on 8 December 2018, at 19:35.